With our beautiful Mediterranean weather, there is nothing better than sitting outside on a star filled night and be warmed by an outdoor gas burning fireplace or fire pit, We work with you or your landscape contractor to make your outdoor space warm and inviting all through the year. 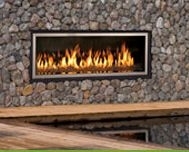 You will find just the right outdoor heating solution at Pacific Energy Company. Valor’s radiant heat advantage has made its way outdoors. 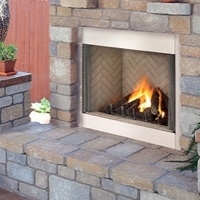 Now you can convert a zero-clearance Valor gas fireplace to a beautiful outdoor unit with our new Outdoor Conversion kit (GV60CKO) and take advantage of Valor’s radiant heat outdoors. Open fronted fireplaces simply cannot match the radiant performance of a well engineered direct vent fireplace with a glass window. Excess air through an open-fronted unit “washes out” heating performance, causing radiant output to plunge. Using a Valor Radiant fireplace outdoors provides the kind of heat you and your family need to take away the chill and provide glowing warmth. A Town & Country product is more than a fireplace. It is an architectural feature, a sophisticated statement about you and your home – and an investment that will retain its value for years to come. Every one of our fireplaces is an industry leader in design and innovation. And because of the flexibility of our Design-A-Fire feature, you can create a fireplace that perfectly reflects your style and taste. Cuddle up around a Marquis outdoor fireplace. Our outdoor fireplaces are designed specifically to withstand the elements and are ideally suited for both a contemporary and classic look. Add the warmth of fire to your outdoor living spaces and you may decide that your deck or patio is now your favourite room of the house! Curl up beside…the best seat (outside) the house. The best “seat” is not always found inside the home. 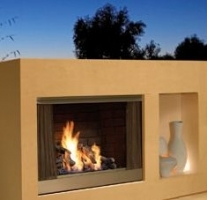 Outdoor fireplaces from Astria can transform an outdoor space or room into a gathering place of comfort. With gas- and wood-burning options, you have a choice of curling up to a crackling fire or enjoying the instant ambiance of a gas fire. 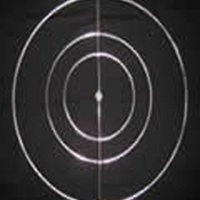 HPC has been been manufacturing outdoor fire effects – stainless steel firerings, match lit fire pit kits, electronic ignition systems, log lighters, decorative glass and more since 1975. Their mission is to use the best quality parts, pack and ship quickly, provide tech support and offer custom kits that complete your custom project.